Morning and Afternoon Sessions have been merged. Two courses will be used simultaneously if needed: one for Girls, and one for Boys. Open to all USA Swimming registered athletes. If your club was not in the meet last year please contact the Meet Director to inform us that you plan to participate. Athletes shall compete at the age attained on the first day of the meet. An athlete may only compete in his or her own age division. Current USA Swimming rules shall govern the meet. All events are timed finals. A contestant may enter no more than four individual events and one relay per day. Dive-over starts may be used at this meet at the discretion of the Meet Manager and/or Meet Referee. Coaches are requested to review Guidance for Dive-Over Starts for Coaches. Officials are requested to review Protocol for Dive-Over Starts. 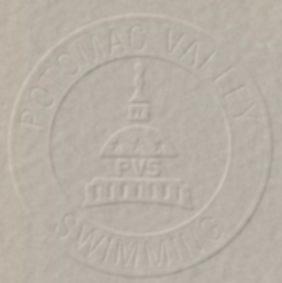 The prescribed Potomac Valley Swimming warm-up procedures and safety policies for Open warm-ups will be followed. The 9 and 10 year olds will be swum (seeded) together to create greater competition and help to shorten the meet length. However, the 9 and 10 year olds will be separated for order of finish, awards, and scoring points. Similarly, the 11 and 12 years olds will be swum together, but separated between 11 and 12 year olds for scoring, award, and order of finish. 13 and Over swimmers will be swum together but separated between 13-14 and 15/Over for order of finish, awards, and scoring. Individual Awards: Medals will be awarded to first - eighth place finishers. Relay Awards: Medals will be awarded to first - third place teams. Team Awards: Teams will be split into three divisions based on team size determined by the clubs registration numbers with PVS. The top three teams in each division will receive trophies for their placement within their division. Teams will be awarded no more than 2 sets of points for a single event. Participating Clubs are required to provide 1 timer for every 25 entries entered in the meet. Higher level officials can be substituted for the timer requirement. The Host Club is required to provide one timer per lane. All certified officials wishing to volunteer to work this meet please contact Lynne Gerlach at lgerlach@msscswimming.com by March 19th. Please include your club affiliation, certifications held, and sessions you wish to work. Officials assigned to this meet should sign in at the recording table at the start of the Warm-up. Certified officials, who have not been contacted, should volunteer their services to the Referee. Fees for individual events are $5.00 and $10.00 per relay. Remit one check to cover the entry fees for the entire team. Do not send cash. Telephone entries will not be accepted. Club entries will be accepted by email. Submission of entries by email must include the following files: the Hy-Tek Commlink II file, The Team Manager Meet Entry Report files (one by SWIMMER and one by EVENT) and an "Entry Cover Sheet." The name and phone number of the Club representative submitting the email must be included. INDIVIDUAL OR UNATTACHED ENTRIES WILL ONLY BE ACCEPTED BY delivery to the Post Office Box address below and will not be accepted by e-mail, unless those swimmers are training with a club and that club is submitting their entries in the required above Hy-Tek format. Clubs submitting by email may submit entries to entries@msscswimming.com, in the subject heading type, "10th Annual SPRING CHAMPIONSHIPS - ****" with the club's initials substituted in place of the asterisks. NO DECK ENTRIES. Optional: Before preparing your entries, events and SCY QT's for this meet can be downloaded and then imported into team manager (go to team manager/file/import/meet events). This meet events file is available for download at "48mm032908.zip". 5:00 P.M., TUESDAY, MARCH 18, 2008. All events 200 yards and greater may require positive check-in. Please check the positive check-in table upon arrival. All events 200 yards or more may require positive check-in.